Hi, my name is Tatyana and I am the creator of Geomegic. I’ll tell you a Geomegic story a bit later, let’s talk about you, first. Are you one of those people who wished they knew how to draw but they just don’t know how? Do you think you have no natural ability to draw and never had a chance to learn, or got inspired to learn to draw by any particular art style? Do you like to doodle? Have you ever covered a page with funky abstract shapes while sitting at a lecture in school or a meeting at the office? Have you tried coloring but got frustrated? You felt it’s too complicated. Details are too small and hard on the eyes. You have no idea which colors to use and wished you could see some examples. You’re afraid to mess up the coloring page because there is only one copy of it in the coloring book. You think how in the world people find this relaxing when for you it’s a whole lot of stress? Are you a parent looking for child development activities that are fun, educational and off-line, non-technology activities? Do you want your kid to become an architect or an industrial designer or spacecraft engineer? Do you want to spend more time with your children doing art projects that are enjoyable for both kids and adults? Are you an elderly person or an elderly person caregiver who is looking for a simple, enjoyable activity to keep the mind sharp and engaged at any age? Are you easily distracted and find it hard to focus or concentrate especially for a prolonged period of time? Do you fidget a lot and just can’t sit still? Are you looking for ways to calm your hyperactive mind and just relax? Are you feeling stressed, anxious, hopeless or sad and just wished there was something that would cheer you up, helped you escape while creating something beautiful and magical? Are you looking for an alternative or additional meditation techniques that would have the same calming, relaxing and unwinding effect as traditional meditation? Have you tried affirmations but find it superficial just repeating phrases over and over in hopes to bring change into your life? Are you an introvert who is enjoying spending time in solitude exploring inner workings of your mind, reading or drawing in your journal or just trying out different things? Are you a bujo person? Do you enjoy spending time drawing and writing in your bullet journal? Would you like to know how else you can use your bullet journal pages? Geomegic is truly for Everyone! Especially for non-creative people. Also is good for art, color & stress therapy, meditation & relaxation, improving focus & concentration, developing spacial perception, learning math and geometry skills in a fun, colorful creative way, keeping one’s mind sharp and engaged at any age and simply having fun! And even if you have an artistic talent, and a natural ability to draw and work with color I still encourage you to give Geomegic a try. I can only imagine what you can create! Geomegic idea came to me about 7 years ago. During that time, and I must add it was a tumultuous time for me, I was doing something that the spiritual circles would call a soul search. I was learning and practicing meditation, going to retreats, getting acquainted with different spiritual schools and philosophies in hopes to understand who I really am, how my mind and psyche works and what do I really want in life. I wanted to find my center, the gifts that I believe are hidden inside each and every one of us. So, in one very passionate meditation, I’ve asked the universe for a gift, something to creatively express myself with. What happened after was nothing short of miraculous. I’ve never drawn anything in my life, in fact, drawing was never my activity of choice even when I was a kid. As an adult, I always wanted to have some form of artistic expression, I’ve tried a few things but nothing kept my interest for long, I just did know what to do exactly… All of a sudden I knew! In the book “Big Magic” author Elizabeth Gilbert says that the ideas are these entities, these energies that are buzzing around us, looking for a way to manifest into the world. That’s how it felt! It felt that my head turned into some kind of a receiver that all of the ideas rushed towards as though they discovered an entryway or a portal into the world. I started drawing funky, colorful, geometric patterns that were full of magic to me as I never created anything like that before. That’s how the name came about – Geometry Magic. Also, I came up with the technique to use geometric grid printed on the page to help me with precision and symmetry and drawing process. At first, it was just a fun, creative activity but then I started noticing interesting “side effects”. I’ve noticed that it’s very satisfying activity and brings a sense of accomplishment. 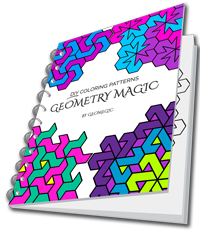 There are no right or wrong ways to create and color the patterns so you can enjoy your favorite colors as much as you want and be in total control over your creations, what colors you use and how complex or how simple your patterns are. It’s also a very cost-effective solution. If you are not satisfied with your creation just grab another page and start over and keep working on it until it’s just right. Also, I’ve noticed that coloring using favorite colors bring a lot of satisfaction. We know that color is an energy. Colors are associated with chakras which are energy centers in our body according to esoteric traditions of Indian religions and are also believed by a Western medical practices to be connected with the endocrine system and different glands and nervous centers in our body so if we are drawn to certain colors it’s not accidental and following that inner call would positively affect your overall well-being. So drawing funky patterns and coloring them with the favorite color had very calming a therapeutic effect on me. I would feel rejuvenated and relaxed even after a quick drawing and coloring session. 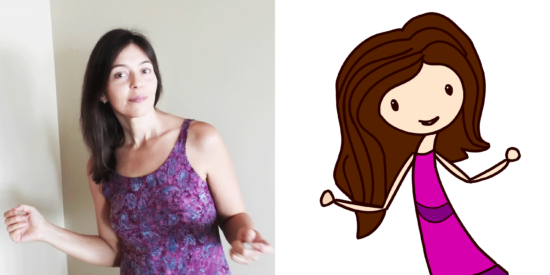 After a while, I started noticing patterns around me, and all of a sudden I knew how to simplify them into a line by line drawing and turn them into coloring patterns. Also, I always found it hard to stay concentrated on any one thing, especially for prolonged periods of time so quick coloring projects are perfect for training focus and concentration. It became a meditation for me. I would crave just sitting down, turning on some nice music and lose myself in beautiful patterns and colors that would appear seemingly out of nowhere. I’d noticed that drawing one pattern would trigger my mind to come up with other patterns and ideas to try in the next project. After some time I decided to share this idea with the world. I was enjoying this so much and had so much fun and positive effects from it I thought there must be other people that would benefit from it. So What Exactly is Geomegic? 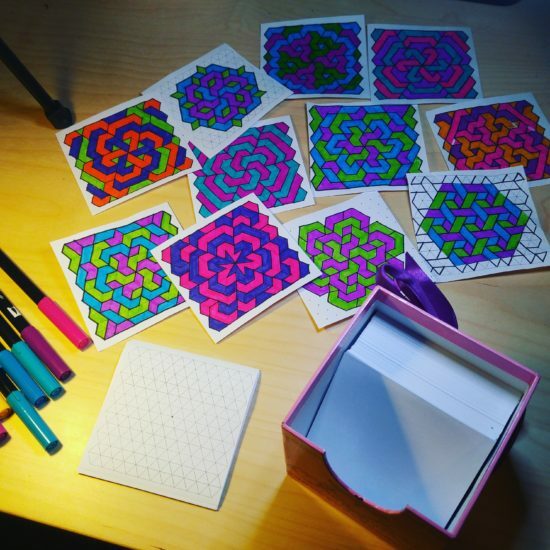 In a 3-second “elevator pitch” Geomegic is a system, a method, a technique of drawing geometric coloring patterns using the grid. It sounds pretty easy, right? It is! All you have to do is print out a grid page, there is a few to choose from in the download section, get a black pen or pencil with an eraser and start designing your pattern. Then, once you’re happy with your design, color it any way you choose, symmetrically, asymmetrically, using 2 colors or 3 colors or as many as you like. 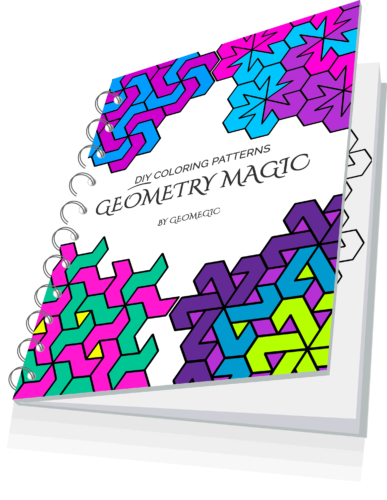 There is no right or wrong way to draw patterns using the Geomegic method. Each person would have their unique style and vision. You become your own coloring pages artist. The possibilities are truly endless. I’ve put together a few videos with coloring design examples for everyone to get started. Trust me, once you start using Geomegic method your mind will explode with many ideas of your own.